"Lucy, what pray tell is "relatable content?" I hear you ask. In this sense, "relatable" meaning something that is familiar to your wider audience, so much so, that they identify with your content, maximising levels of engagement. Being relatable is forever important as that's how, why and when people are more likely to return to your blog / Youtube channel / social media accounts. As a mini disclaimer, in no way am I targeting any specific individuals with the below, nor am I bitter / jealous of the people that create this sort of content. It's just that recently I've seen more and more blogs and Youtube channels emulate one aesthetic, with the same blog layout, the same blog design and the same video format. I don't think it's too much to ask, but I want to be seeing content which I can actually identify with. I've been unfollowing more and more blogs and Youtube channels lately which I feel I can no longer relate to. 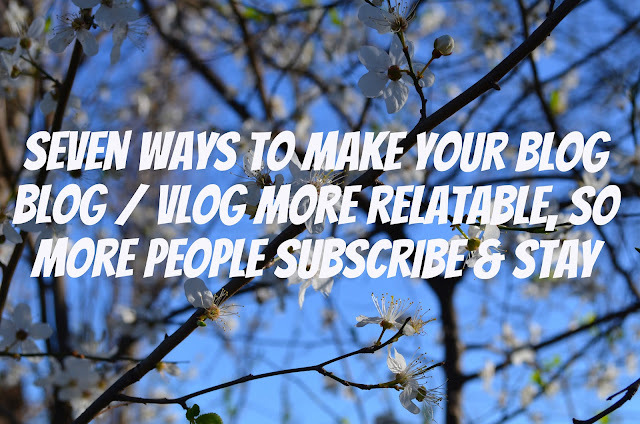 So below are my tips for a more welcoming, relatable blog / vlog - the types that people are more likely to subscribe to and stick around for. If I wanted to read magazine type content, I would... pick up a magazine. Same applies to vlogs and videos. If I wanted to watch something of film quality, I would hit up Netflix or Amazon Prime. More often than not, blogs are increasingly adhering to the same layout, the same aesthetic, the same massive pictures which fill your screen. Don't buy that blog template that everyone and their cat has. I know it's tempting to buy blog templates if you're not technically minded, but as so many templates are crazy expensive (I was once quoted £1000+ for one and I was like was Hell No), people turn to the handful of affordable blog template options out there. And voilà, the reason why so many blogs look identical these days. For me personally, the best blog designs are simple and succinct. Blog name as a header, black and white colour scheme, all your content in the middle, and a side bar with all your extras. What more do you need? It's not rocket science, and your design / layout can be easily adapted yourself without having to pay out the nose for someone else to do it for you. Why not teach yourself some simple HTML and CSS? Google search these and you'll find plenty of fantastic tutorials on these. I've unfollowed most of the 'glossier' blogs and Youtube channels lately, because I'm looking for candid videos and pictures, and more natural, simple designs that are less 'fussy'. Be realistic. These days we are so used to seeing people present a polished version of themselves. Perfect hair, perfect make-up, model-like poses, photo shoot style photography, and very business like text about what they're wearing today. They have an immaculate home, and stock photos of flat lays for every occasion. Don't be afraid to share your flaws - this is what makes you human. And news flash.... being human makes you relatable. Don't vlog from under your duvet with a full face of make-up on, saying you're about to go asleep (you're clearly not!) And don't feel the need to always have perfect hair, and be dressed up to the nines. Vlog in your pyjamas before you've chosen your outfit for the day. Vlog with wet hair. Remind us how much like us you really are. If you like niche things - like you still love Pokemon - share it. Like how I'm pushing 30 and still adore Kinder Eggs. These quirks makes you unique and interesting. Don't be one of these blogs that posts 1,456,879 pictures of the same outfit and your face from different - but not all that different - angles with virtually zero text. I don't need to see something from that many angles. If I like what you're wearing, a few pictures will suffice. Plus scrolling past all those massive pictures is hard work. Make life easier for your readers by not going too picture heavy. Instead of all those extra pictures, why not write more? I think I'm in the minority here these days, but I actually follow blogs based on their writing rather than their visual content. I always find it so much easier to relate to someone and warm to someone through their words. If you go from raving about the new season Primark and Forever 21, then later down the line only rave about designer make-up, designer skincare and designer bags... it's too big of a leap and you risk alienating your audience. Whilst it's perfectly ok to dabble in high end goods every so often, if your blog or Youtube channel becomes inundated with these over and over again, people will switch off. It's novel to see products like these every so often, but seeing them time and time again reminds people like me that we can't afford these things and are unlikely ever to. Don't be one of these people who have always been sensible with money, then make a bit of money from your Youtube channel or blog, and then become reckless with money. I've seen lots of posts lately where bloggers have justified these high end buys as an "investment" to help better their blog. Sorry, but I don't agree. You having a designer bag and including it in your OOTDs doesn't better your look. Someone with true style can carry off a look without having resort to designer everything. Most of your audience won't have access to the funds you do, nor will they receive beauty press samples through the post like you do. They have to spend a hell of a long time saving to afford that dream bag which is passed off as a nothing purchase on YouTube in someone's "look at all my designer bags collection haul". Don't promote unhealthy spending habits to those who can't keep up with the payments. Remember, you are massive influencers - influence for good, not bad. Blogger / vlogger protocol states that you need this DSLR, this vlogging camera, a lighting system rigged up in your house, final cut pro, and a macbook to be the top of your game. Which is definitely not the case. I've read plenty of great blogs where the pictures have come from their phone and the quality is every bit as good - proof that you don't necessarily need an expensive camera. More candid photos taken in the moment are a lot more relatable - rather than the heavily posed and pre-meditated ones trying to be all photo shoot which are cropping up more and more on blogs and Instagram. I appreciate that the evenings can be pretty dark, but you don't need pristine lighting. You are not a professional photographer or TV producer. Nor are you a model. When people have lighting rigged up for their videos or blog posts, I automatically assume that that blog is no longer directed to people like me, it's more directed to brands and companies for future potential sponsorship: 'look at me, I have pristine skin. Work with me.' Also there is plenty of good alternative video editing software out there - most free from the Internet - and I will write a separate post on these another time. Macs are more aesthetically pleasing for those "where I work" shots I realise, but macs are not the be all and end all. I wanted one for home use for ages, but I discovered they weren't all that. I use a Dell laptop to work from and I have a widescreen Toshiba laptop better suited for watching movies and TV shows on. Both of which are really good performers, and so much cheaper than a mac. Both of my machines in fact add up to less than that of a single macbook. So in summary, spending lots on fancy equipment doesn't necessarily guarantee better content or better success as a blogger / Youtuber. It's ok to be different. Be you. Recently I've been seeing more and more blogs and Youtube channels covering luxury holidays that only the small percentile of the population can afford. Particularly when priced at a £500+ a night. Whether it's holiday and travel, or anything else luxe, always strive to find a balance between luxury goods and services, and then ones that the majority of your readership / listeners can afford and actually experience. If you've one of the lucky few who have recently been whisked away all expenses paid to some tropical island somewhere, don't overload your Instagram with smug holiday pics. By all means post pictures, but don't go crazy - a few will suffice. Go overboard with the pics and you risk alienating your audience. Balance anything luxe and particularly expensive, with content that is less 'flashy'. For example if you've recently been on a luxury holiday, why not go away for a few days to the countryside? Or don your comfiest casuals and go camping? Show your audience that you are just like them (most of them being more likely to go away for day trips and weekends away in the same country rather than ramping up the air miles and heading abroad!). I've seen it all. I've seen lookbooks of girls in the snow wearing heels and no coat, and I've seen girls "pop down the road" dressed to the nines. As good as these pictures look, this just isn't realistic or relatable. This is more like the sort of photo shoot you want to see in a magazine. And that's where they should stay - in a magazine. I've loved the normcore look of late as it's more universal and accessible. If you're popping down the road to the post office, you don't need to wear a ball gown. Jeans, flats and a sweater will suffice. My favourite lookbooks of late have been blue jeans, white Stan Smiths, knitwear and delicate jewellery. Simple but effective. Think of it as off duty model. Whilst it's nice to dress up every so often, more of your audience will relate to you if you dress in the sorts of things that you can easily buy and that are easily accessible to everyone. The fact that Primark haul videos do so well on Youtube is no coincidence. Realistic and relatable is key. And here concludes my seven tips on how to prevent your audience from going AWOL. Again I will reiterate, that the above is not intended to be a whinge or attack on bloggers / vloggers / any specific individuals. I am just sharing what personally makes me more likely to unsubscribe from an account - whether it be Instagram, a blog or Youtube. I don't want to see glossy, I don't want to see perfection. I want to see normalcy on my newsfeed. Because normal is relatable. I couldn't be more with you on this. I've recently cut down on the amount of blogs and Youtubers I follow and the main reason for this is because too many of them are no longer relatable.